Core-crosslinked shelled-core microspheres of poly(styrene-co-methyl acrylic acid) (PS-co-PMAA), with cores rich in PS and the shell rich in PMAA, were synthesized by one-stage soap-free emulsion polymerization. A palladium (Pd)-iminodiacetic acid (IDA) complex catalyst is loaded on the shell of the PS-co-PMAA microsphere, which results in the advantage of high dispersion degree and, therefore, high activity. The resultant polymeric microspheres catalyst systems are then applied to catalyze the Suzuki reaction of aryl halides with phenylboronic acid in an ionic liquid of 1-butyl-3-methylimidazolium tetrafluoroborate ([bmim][BF4]). Our catalyst systems are proved to be efficient and active for both aryl bromides and aryl iodides. Compared to traditional Pd(Ph3)4 catalyst, the PS-co-PMAA-IDA-Pd catalyst used here affords higher yield of Suzuki reaction at even lower catalyst concentration. In addition, our polymeric-microsphere based catalytic system can be easily recycled at least four times with high activity in ionic [bmim][BF4] liquid. 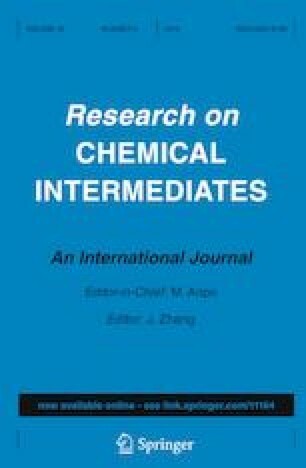 The online version of this article ( https://doi.org/10.1007/s11164-019-03738-y) contains supplementary material, which is available to authorized users. Jianzheng Zhang and Jingshuai Chen have contributed equally to this work. This work was supported by the National Natural Science Foundation of China (Grant Nos. 21706002), Natural Science Foundation of Anhui Province (1808085QB53), and the Research Fund of School of Chemistry and Chemical Engineering (Anhui University).